A new compound, NaZn4(OH)6(SO4)Br·6H2O named “Br-gordaite”, was obtained by mixing of ZnO with a solution of ZnSO4 and NaBr. The Br− ion occupies the Cl− ion tetrahedral position of the brucite-like layer of the gordaite structure without any other changes relating to the structure and chemical composition. 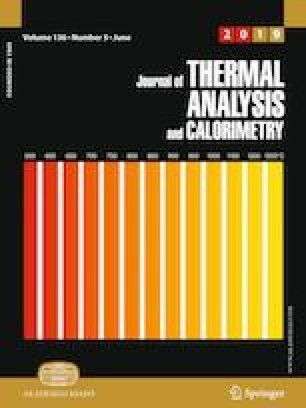 The thermal decomposition of the new phase was studied by DSC–TG(DTG)–MS in regard to the thermal events and mass loss during volatile releasing, while phase composition and chemical composition of the initial and heating products were studied by XRD and SEM–EDAX, respectively. All processes are endothermic: (1) dehydration (20–185 °C), (2) dehydroxylation (185–320 °C), (3) evolving of bromine (400–600 °C) and (4) evolving of SO3 (770–1165 °C). One-stage releasing of bromine from the “Br-gordaite” was observed at 400–600 °C. Bromine-containing intermediate crystalline phases were not detected by XRD during the “Br-gordaite” decomposition. The presence of bromine in the solid residue at 340 °C was established by chemical analysis, while after 600 °C the bromine was no longer present. The final products of the thermal decomposition of “Br-gordaite” are ZnO and traces of Na2Zn(SO4)2. The thermal behavior and the obtained thermal decomposition products of the “Br-gordaite” were compared with other minerals with Zn octahedral–tetrahedral hydroxide layer.